Grab up to $6,700 with GrabRentals! 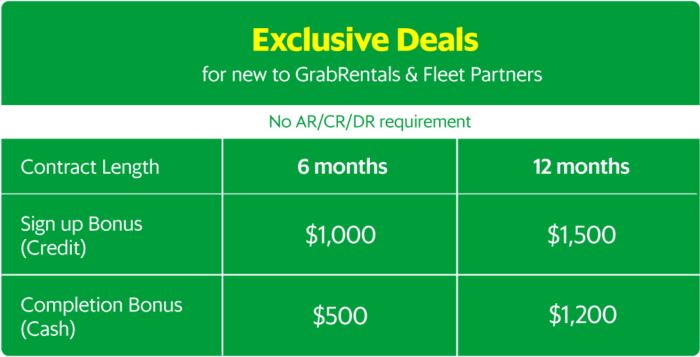 As part of our 2 Year Anniversary celebrations, we would like to extend these deals when you join GrabRentals or any of our partner fleets. With car rental rates from as low as $38/day, you wouldn’t want to miss out on this deal! Sign up period: Between 13th Aug 2018 to 5th Oct 2018. Rent from GrabRentals or any participating GR Fleet Partners. New to GrabRentals or any of our participating GR Fleet Partners. Collect the vehicle and get activated / update the vehicle details with GrabCar account by 12 Oct 2018. Sign Up Bonus will be paid 100% into driver’s credit wallet on 4th week after activation/vehicle update week. Completion Bonus will be paid 100% into driver’s cash wallet on week 25 / Week 51 of activation/vehicle update week. Only GC Economy trips count toward the trip requirement targets, including GC 4 seater, 6 seater, Grab Family, GrabShare, GrabAssist, GrabCar Plus and JustGrab (Excluding destination trips). Jobs outside Singapore are not allowed and do not count. Grab reserves the right to withdraw, amend and/or alter any part of the terms and conditions of driver incentives at any time without prior notice.